The VT series of in-line duct fans offer a simple "no fuss," and flexible in-line ventilation solution to many domestic and commercial ducted extract or supply air applications. All VT in-line fans combine a powerful external rotor motor with a factory matched non-stalling backward curved impeller. The VT series are particularly suited to systems that include long duct runs, filters, dampers and other ancilary equipment where high static pressures are generated. All VT fans incorporate 1ph 230V 50Hz, IP44 rated external rotor motors with integrated S.T.O.P (Safety Thermal Overload Protection). 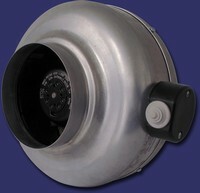 The range consists of 7 nominal model sizes suitable for connection to 100 (4 inch) up to 315mm (12 inch) diameter circular ducting. All models are manufactured from strong corrosion resistant galvanised steel and are supplied as standard with prewired electrical junction boxes for easy installation.